100% Brand new and high quality 20pcs Neon Bulb Indicator 5mm Lampada Lamp Red Neon Light 5 mm Neon-Light • Color : RED Orange • Size : 5x13 mm • Minimum voltage : 60 volts. 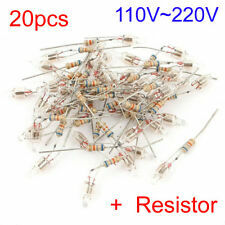 • With Resistance for 110V~220v • Note: The picture is for reference only and the resistance is 150K by default. 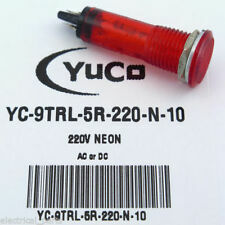 • Package included : 20pcs neon lamp. 100% Brand new and high quality 20pcs Neon Bulb Indicator 5mm Lampada Lamp Red Neon Light 5 mm Neon-Light • Color : RED Orange • Size : 5x12 mm • Minimum voltage : 60 volts. • With Resistance for 110V~220v • Note: The picture is for reference only and the resistance is 150K by default. 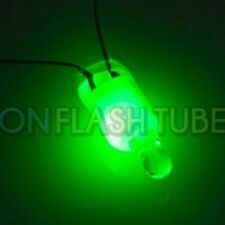 • Package included : 20pcs neon lamp. 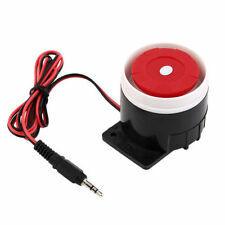 Specifications: Product Name LED Buzzer Flash Light Model AD16-22SM LED Light Color Red Light Voltage AC DC 24V Current 20mA Size 66 x 29mm / 2.6" x 1.1"(L*D) Material Plastic, Electric Parts Color Red, Black Weight 20g Package Content 1 x LED Buzzer Light Description:For electricity, telecommunications, machine tools and other equipment as directed in the signal line, notice the signal, accident signal and other indicating signal.Adopts LED lamp with the characters of long life and low energy consumption, its concealed terminal is both safe and creditable. 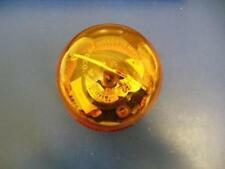 Chicago Lamp 2150QA3 Indicator Lamp Amber Lot Of 86 1/2W 125VAC ! NOP ! Edwards 125LR Red Replacement Lens for Strobe Light ! NEW ! Edwards 349 Signal Indicator Backbox For Use W/ 340/435/439D Series Bell ! NEW ! ASI P5255-5-0-2B Selsyn Indicator ! WOW ! ASI P5255-3-5-0B Selsyn Indicator ! WOW ! BLH Electronics 7000 Signal Conditioner Model 7000 ! WOW ! ASI P5255-4-3-0B Selsyn Indicator ! WOW ! 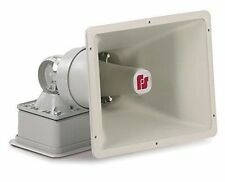 Edwards 5520-N5 Duotronic Signaling Horn 120V .28A ! WOW ! With Resistance for 220v. Color : RED Orange. Phoenix Contact MCR-C-UI-UI-DCI-NC 3-way Signal Conditioner ! NEW ! Specificatiosn: Description: Features: 2 Pin Terminal, AC 220V Working Voltage, Panel Mounting Design for Easy Install of it. The Indicator Lamp is suitable for electronic equipments or telecomunication field for signals use, such as signal indication, advance notion, industrial accident indication or other indication use. Note: US buyers should buy a voltage transformer in order to use this charger, here is not included. 2 units New High Quality 30mm Illuminated LED. Color :RED. Schneider Kreuznach Componon-S Enlarging Lens 2.8/50 ! WOW ! RED thin wire Antenna. pakcage: 1pc indicator( the gauge pannel not include). BLACK thick wire ground ( (the motorcycle steel Shell). Connection: RED thick wire 12V. Receive distance : about 1m. ). 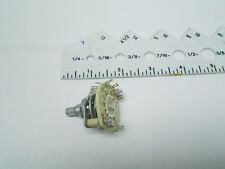 Specificatiosn: Description: 2 terminals, thread connection, plastic case, recessed mount. Used for indexing signal, anticipating signals, emergency signal and other indexing signals in electric power, telecommunications, machine tool, motor, home appliances, etc. . 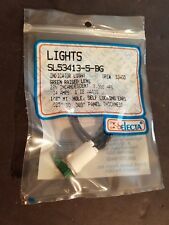 Description: Bulb Indicator. Energy saving and low maintenance cost. Terminal mount for easy connection and strong conductivity. Useful as general indicator and alarm lights. These panel mount pilot lights are sure to give you a visual status cue of any indexing signal, anticipating signals, emergency signal and other indexing signals. Simply drill an 10mm (2/5 Inch) hole and push-in, lock with nut and washer. Description:Bulb Indicator.Energy saving and low maintenance cost.Terminal mount for easy connection and strong conductivity.Useful as general indicator and alarm lights.These panel mount pilot lights are sure to give you a visual status cue of any indexing signal, anticipating signals, emergency signal and other indexing signals.Simply drill an 7mm (0.28 Inch) hole and push-in, lock with nut and washer. 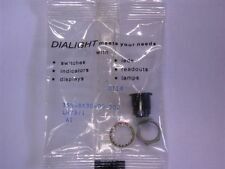 Dialco panel light, “AMBER” 507-3918 28 volts 40 ma. I have other colors as well, including quantities of green, dark blue, and red, don’t hesitate to ask! Specifications: Descriptions: Features: Wied DC 12V Working Voltage, Red light, White cables. The DC 12V Indicator Lamp is suitable for water heating use. 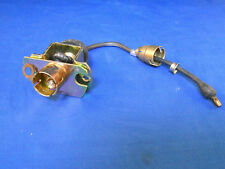 Aim Inc. 122-1657 Servo Cable Assembly ! NOP ! 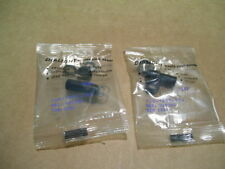 Aim Inc. 122-1661 Cable Assembly ! NOP ! Siemens SP6FX80025CA051BA0 Servo Cable 70 FT W/ 6-Pin Connector ZP2L3/2 ! WOW !